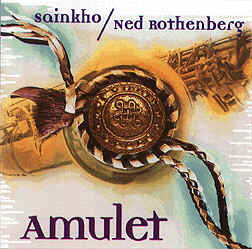 Sainkho Namchylak, voice; Ned Rothenberg, alto saxophone, bass clarinet, shakuhachi. 1st dance (04.27), Tovarischi II - Toronto (03.33), Urzup kherge/wee hours (05.01), What shakes (05.30), Lake song (05.10), Ancient garden (05.23), Vision (05.14), At altitude (06.46), 2nd dance (02.50), Slow rain (04.22), Call & response/dance reprise (09.42), Low & away (07.14), Tovarischi II - Tallin (03.44). Recorded in various locations, 1992-1995. Front cover photograph (reproduced on the left) by Albano Ballerini.